The day we are born is always a special day. It marks the day that we begin. It is a beautiful day and totally worth remembering, sharing, and celebrating, in my opinion. The Day You Were Born Keepsake is such an awesome gift. I just got Cassie hers. It is so AWESOME!! I absolutely love it. It is a million times more awesome than I thought the completed piece would be. I almost cried when it got here. I put that it was a gift and I was able to get a little card in the box especially for her. The frame is beautiful. The whole thing is just absolutely beautiful. I haven't had such an interactive review in awhile now. This was just what I needed to give me a little bit more pa-zaz in my reviews. I am able to see so much detail in this product, I could talk about it all of the time, I actually do. I picked the celestial background. I have always told her and Abby I love them to the Moon and Stars, where the aliens live and the angels fly. This was just a perfect fit. 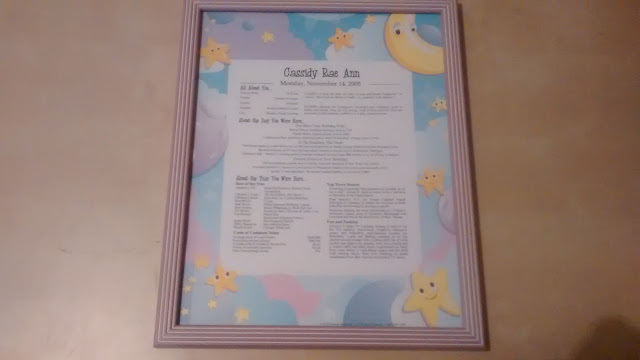 It has her name on the top "Cassidy Rae Ann" her name meaning, All about her. Birth weight, length, time, hospital, and city. Her zodiac sign and meaning of the sign. All about the day she was born, who she shares a birthday with, what was headlining, famous events that happened on her birthday. Apollo 12 was launched on the day she was born!! It lists the top things of the year she was born. TOp news stories, fun and fashion and the OMG moment: the cost of common items when she was born. $6.41 for a movie ticket, $2.20 for a gallon of milk. This is such a great product. I really love it. I highly recommend it. I received this product for free in exchange of an honest, unbiased review.